Manufacturer of a wide range of products which include chemical pumps. We are leading manufacturer and exporter of chemical pumps based at Ahmedabad, India. We have a complete range of chemical process pump as per ANSI B73.1 standard. The design is a back pullout. Large varieties of models are available at 1450 RPM and 2900 RPM at 50 Hz & 1750 RPM and 3500 RPM at 60 Hz. ANSI series chemical process pump is horizontal single stage centrifugal pump. 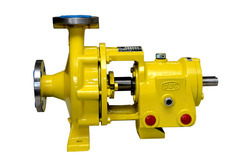 Pumps are available in all material of construction. E.g. Cast Iron, SS 304, SS 316, SS 316L, CD4Mcu as per customer request.